We know we are the official beer of the clam and this is a squid dish. But with this hot weather, we thought a classic Italian favorite mixed with some spicy local flavor would be just right. And you have to go with the VEGA brand peppers for this one since they’re from Cranston. 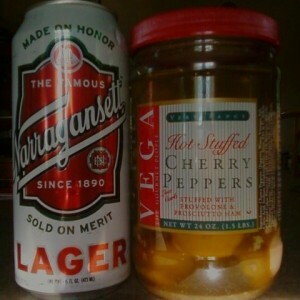 Plus one of our Facebook fans posted this photo of a Gansett with the VEGA stuffed peppers. If using fresh squid, gently pull off the head and tentacles from the body sac. Cut off the tentacles above the eyes. Reach into the body sac and pull out and discard the quill-shaped plastic-like bone. Peel off the skin from the body sac. Cut body sac into rings. Tentacles can also be used. Mix flour, garlic powder and pepper in a plastic bag. Rinse sliced squid, then pat off excess moisture. Shake in the bag with flour. Add about 1/4 -inch of corn oil to a heavy skillet and heat over medium-high heat until very hot. Squid will stick if oil isn’t hot enough. Add some of the squid, without crowding. (You’ll probably have to cook in two batches.) Cook until crisp and brown, turning once. Drain squid on paper towels. Finish the second batch (heat more oil if needed) and drain. To skillet, add chopped garlic and saute quickly. Add some sliced hot cherry peppers and a tablespoon of their juice. Heat, then add the squid; heat through, then serve.